It’s not every day you get to uncover a piece of history. But Dr. Asa Eger, assistant professor of Islamic history, and a Roman archaeologist colleague from Case Western Reserve University did just that when they began searching for the missing eighth to 12th century garrison port Hisn al-Tinat (literally translated as Castle of Figs) in Turkey in 2005. Originally, they were surveying sites near Antioch and then received an invitation to survey around a site on the nearby coast of Iskenderun. They knew there should be another Roman and Islamic site nearby and began gridding the area. On the very last day, in the very last section of unexamined land, they found a large, low mound. Other pieces of evidence started to add up. They discovered a relic stream bed using 1960s declassified spy satellite photography. They connected the area with the remains of an old Roman road excavated previously. They found a marble column. “These things don’t move very far,” Eger says. In the end, what we do is history. While the intervening years had shifted the water and covered fortification walls and a tower, Eger was sure they had found the remnants of an area where Islamic and Byzantine (Roman Christian) people lived close to one another. Eger has long been interested in the people who lived in the edges of their communities. The places where Islamic and Byzantine people met often were written of as places of Holy war, he says. But what about this particular area? Historical sources say Hisn al-Tinat had garrison soldiers. However, the artifacts located in the area seem to suggest an open border between the two communities with trading. He has found cooking bowls, oil lamps, fine luxury glazed wares and coins. Green and white patterned dishes, imported from Iraq. A Syrian yellow glaze produced in Antioch. And grain bins which indicate a home. This summer, Eger and two UNCG students – undergraduate Nick Williford and Jonathan Flood, who will graduate this month with a graduate degree in geography – will travel to Turkey to continue the excavation work. In addition to these students, Eger will have students from other universities on the team as well: University of Victoria, University of Arkansas, University of Chicago, Bilkent University (Turkey) and Brown University. 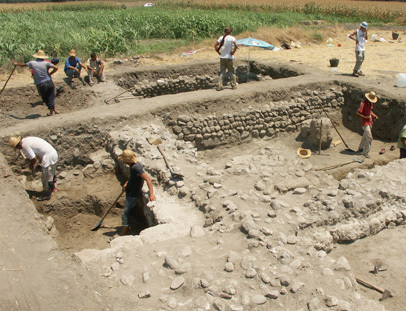 Weekends will consist of study field trips to neighboring sites and excavations (and especially the towns of Antioch and Tarsus) to learn more about the region and its history. It’s the perfect blend of archaeology, geography and history. Eger should know. Even with his training as an archaeologist, the history calls to him. “In the end what we do is history,” he says.